2joined TCF in 2010 as a Director having spent 8 years at Diageo where he headed the Global Digital Marketing Team, credited with step-changing the marketing of brands including Johnnie Walker, Guinness and Smirnoff. He has also worked agency-side and began his career at BT, successfully launching broadband in the UK. He sits on the IDM Digital Advisory Council. 3has 25 years’ experience in relationship marketing as a user and supplier of data-driven marketing services, working with B2B and B2C clients including Diageo, NatWest Bank and BT. He is currently involved in integrating online and social media with traditional RM channels; and he bridges the gap between marketing and IT. How ‘Social’ relates to ‘CRM’? What data is required to support SCRM? Which of this data need to be stored on the database? Next steps for brands new to SCRM? In data-poor 1 markets, such as consumer goods, pharmaceutical and some retail, brand management aims to build in consumers’ minds a set of perceptions and attitudes that leads to positive buying behaviour. Research has always shown brand managers that consumers are not a homogeneous set; they contribute a differing value to the brand (the Pareto 80/20 rule exists in some form with almost all brands) and there are different levels of engagement 2 with the brand (Figure 1). Importantly, multiple bodies of research have shown relationships between ‘engagement’ and net sales value (NSV). 3 Brand advertising and sales promotion are blunt and costly tools that target the whole market. Advertising dollars in these areas have little accountability, and the relationship between advertising spend and NSV or gross margin (GM) is unclear, beyond a macro level. In data-rich markets, such as financial services, automotive, telecoms and some retail, direct marketers have for years combined sales data, profile data provided by customers and varying quality of data from external sources, such as neighbourhood, credit or lifestyle databases. They segment their customers based on value, needs and (occasionally) psychographics to predict the propensity to purchase. They then use sophisticated targeting (outbound to the customer, or inbound when the customer calls in or uses the website) to communicate the right offer to the right person at the right time. These techniques can uplift response rate versus random selections of contacts, but they are still blunt instruments. The interactions are designed to sell, not to engage or build relationships. Although ‘traditional’ CRM helps manage Customer Interactions on a large scale, it does not help in building relationships and mutual trust between consumers and brands. To build relationships and trust, it is necessary to know the customer well and not just be limited to mere ‘transactions’ as was the case with ‘traditional’ CRM. Social media enables the brand to extend its personality to engage with consumers on their terms, at the time they want, where they play, where they work, when they are travelling and through channels that they chose. Brand marketers can just listen to digital conversations, using an ever-increasing number of tools, to determine whether their brands or categories are being mentioned, tap into the feelings or sentiment in the market, and understand the velocity and ferocity of conversations. US clothes retailer Gap has been forced 4 to drop its new logo within a week after its re-branding was attacked on social networks and online forums. They may listen post campaign to sense reactions to the campaign. The more astute brands listen all the time and derive insights to help shape future creative and campaign approaches. From a brand engagement perspective, content, designed to entertain, inform, educate or provide insight, can be designed to connect with consumers in the places where target consumers play and work (‘fish where the fish are’), develop relevant conversations with those that show interest and convert them to win sales and even advocacy. Consumers can engage with this content at a level to suit themselves — at a peripheral level or at a level that involves more interaction and active participation with the brand. Pioneer brand marketers are building listening posts and workflow processes to identify and then do something with this insight (eg push sentiment insight quickly into campaign teams) and to decide whether, and how, to react to comments. They are identifying influencers in their market and at least extracting the names and digital personas of these influencers so that they can listen more deeply to what they say. Brand marketers are pioneering the use of social geo-location data (eg via Foursquare, Gowalla, Facebook Places) to understand the movement of their target market (‘check-ins’ at airports, hotels, corporate headquarters tell you something about who you are dealing with) and push local offers to consumers in a certain area (eg Pepsi's ‘Pepsi Loot’; Dominoes pizza — driving footfall through FourSquare). They are beginning to work more closely with retailers, sharing data with each other, driving footfall for the retailer, creating a win-win-win between consumer, retailer and brand. Some brand managers are considering replacing their traditional CRM approaches in favour of ‘Facebook as the new CRM’ (ie where CRM is defined as setting up a new Facebook brand profile, recruiting ‘fans’ and interacting with them). ‘Social is relationship marketing without the login’ as one brand director told us. If they do this, they will be able to communicate at a level with fans, keeping in touch with them continuously and at a relatively low cost and low hassle — at least at first. There is inherent and significant risk in doing this: First, social containers (eg Facebook) may fall out of fashion with their market (eg MySpace) or lose profile because of financial problems (eg AOL). The brand may lose its fan base almost overnight, with no record of who they were as they have never ‘owned’ this data. Secondly, they may lose control of how they can interact with their fans with social policies not being theirs to control (eg changes in privacy regulation; field sizes; data a brand can use in profiling). Thirdly, they will be communicating with all customers alike with little chance for personalized, segmented communications. Competitors will be doing the same, just as visibly. Uploading photos, running fan competitions, giving coupons to fans to drive them into retail outlets that stock their brands. A Facebook page will become ubiquitous in the category, and the inability to personalize and differentiate will become a problem. Lastly, and most importantly, they will be missing out on a strategic opportunity. 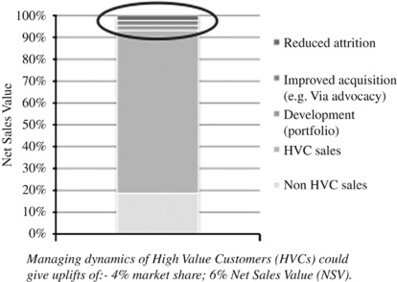 HVCs in any brand, in any sector, are responsible for the lion's share of a brand's wealth, and managing them carefully can lead to significant uplifts in market share and sales (see Figure 2). If a brand could find a way of panning through all of its social media contributors and identify the gold nuggets, which are HVCs, HVPs and influencers, then this important asset can be managed carefully over time. 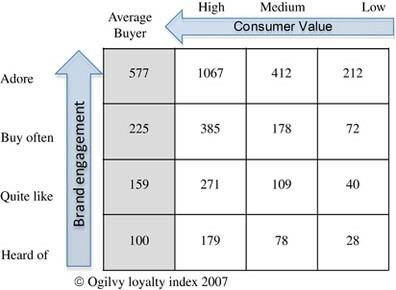 If a brand can even slightly increase the numbers of HVCs (through better engagement — which leads to increased advocacy, retention and penetration), then market share and sales can increase dramatically, as Figure 2 shows. 5 Data are the defining factor of SCRM as the basic building block for a customer-centred business strategy. SCRM will help move interested customers from ‘social’ engagement and basic interaction to a deeper level of personalization, engagement and involvement. Social does not replace existing CRM efforts. Instead, it adds more value by augmenting and improving traditional CRM communications. Social provides an opportunity to increase consumer engagement, but can also be a great hunting ground and place for brands to look to acquire consumers to full CRM programmes. It provides an organized approach that connects business units to the social cloud 6 — giving them the opportunity to respond in near real time. Budweiser: Not everyone agrees with a HVC strategy. At the WFA/RVD Global Advertiser Conference in April 2010, Istanbul, Chris Bruggraeve, CMO of Anheuser-Busch inBev pointed out that heavy drinkers do not make much impact on the firm's bottom line. Instead, promoting temperance pays for itself over time by building long-term brand reputation and trust. ‘We are not interested in the 0.001 per cent of people who binge-drink,’ he added. ‘We don’t need them. Half of the world's population hasn’t even tried to drink beer, so if we can get 5 per cent of those to drink one beer everyday, we will be very happy’. Web strategist Jeremiah Owyang 7 says: ‘Traditional CRM suppliers, such as Salesforce.com and SAP are starting to integrate data from Facebook, Twitter and other online social networks. Dell and Comcast, both leaders in social marketing and support, have already integrated Twitter data to allow brand managers and support teams to actively track what′s being said in tweets’. The objectives of SCRM need to be clear in order to define the conceptual data architecture. Where does relevant data exist, and how can the data ‘cloud’ be managed to achieve the objectives? SCRM objectives must be one or more of the following: to (1) identify, (2) engage with and then (3) sell to people within a target market through building a stronger relationship. These overall objectives are not any different to those of any CRM programme. The difference is having access to data and tools that allow more effectiveness in all of these areas. For instance, the target market could be identified, engaged and sold to in a better way through (1) listening to social conversations and accessing deeper insights into behaviours of the whole market to better engage with them through any media; (2) attracting fans through social content, fan pages and websites; (3) panning social media and fan sites to identify brand advocates, influencers and HVCs and HVPs with a view to developing a greater insight on them, and maybe to interact with them more personally; (4) interacting with (and promoting messages to) consumers when they are most receptive and (5) making it easier for them to buy from us when and wherever they want. Thus, traditional 1:1 CRM data models are disrupted and need to change. Figure 3 shows the various stages of the traditional CRM data model from data to engage to data to identify. What are the changes in data content enabled or forced by the emergence of Social Media? Which data need to be stored in-house versus leaving in the Cloud and using in situ? the user's ‘Friends’ provide networks of potentially like-minded individuals. The social cloud is a hunting ground for marketers. Internal policies and local legislation must determine a firm's strategy around recruitment of names from social media, but with the right permissions brands can filter off these individuals in order to keep closer to them. Moving potential HVCs to a database creates a problem. Collecting and accurately using the data needed to join together two versions of a record for the same person has exercised the minds of direct marketers and CRM practitioners for almost 50 years. In most countries without wide and open use of national identity numbers, this is still an imprecise science with a high degree of manual intervention despite sophisticated ‘matching’ algorithms. The advent of social media brings two substantial additional challenges. First, there are ever-increasing numbers of potential records for every physical individual. An avid social media user can easily have 10 different identities in social containers (see Figure 3), covering their personal, social and business lives. In addition, matching criteria typically involves data that are prone to change such as a user-selected name, ‘handle’, email id and mobile phone number (Figure 4). Secondly, the individual may not want different versions of their existence to be joined together. It would be a brave marketer who joined ‘@smithj12’ on LinkedIn to ‘thebigcool’ on Facebook (without seeking and obtaining the individual's approval) even if they did share the same email address. The risk of making the wrong matches is high and has major implications for privacy, data protection and identity theft. Marketing to an individual wrongly matched to a Facebook Places’ consumer based on their proximity to say a cinema when they are simply working late is not going to be popular. Another disadvantage is the risk of sending a message of ‘we know where you are and what you are doing’ feeling to an individual who does not want their personal life joined to their social, or family life. These issues underscore the importance of basing all activities on the permission concept. Assuming that data has been acquired legitimately a firm may communicate with the supposed unique individual, disclosing two (or more) sets of data, and ask them to confirm that they are (a) correctly identified, (b) may be combined and (c) willing to give permission for an intended communication programme (based on the merged data). The latter two are sometimes all a company has in SCRM. It should be noted that in some markets (eg Africa), it is common for one person to have multiple mobile numbers either on discrete devices or in some cases a selection of SIM cards. On a social site there may be a name or nick-name, handle, email address and mobile number, none of which are capable of ratification and are less certain in terms of matching. While matching is key, it will require robust processes and a clear policy about will be done with the consumer record once built. Historically, understanding of customers has been based on geo-demographics, transactions, research and possibly a record of other behaviours such as complaints and response history. These will remain important but provide a limited customer ‘understanding’. By monitoring, assimilating and understanding the attitudes and behaviour of individuals in their social environments, it is possible to have a much greater depth of understanding of their likes and dislikes, their thinking, their motivations and for some, their ‘passions’. This will be derived from their self-motivated inputs, not from often misleading self-completed questionnaires. 9 Listening can be database-independent, with software tools rapidly sifting through terabytes of data to identify conversation themes; velocity and ferocity of conversations and brand mentions. Brands that want to invest in closer monitoring of HVCs, HVPs and influencers will want to extract the names and some of the social data available onto the database consumer profile. It is not feasible or even necessary to store all the data from social media containers. What needs to be stored on a company's database is codified insight based on the individual's social behaviour to help segmentation and personalization. 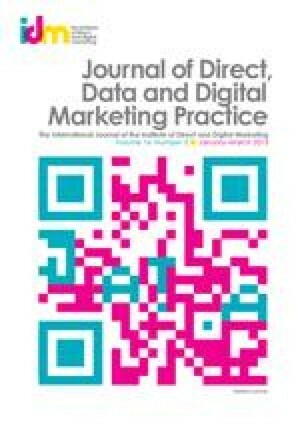 The data to be codified will depend on the sector, but social data could show micro-segments of customers who are frequent visitors to coffee bars during the working day; commute 90 min or more into Manchester Piccadilly station; fly internationally during the week to a European airport more than once per month; stay in business hotels more than 1 per month; passionate about football; are eco-savvy; watch a lot of TV; love celebrity culture. Companies may need to derive nuggets of understanding themselves by taking feeds from the application programming interfaces (API) of social media owners (eg Facebook Connect) and doing the analysis themselves in the short term. 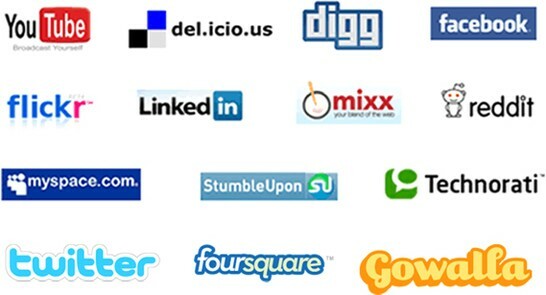 However, there is clear evidence that the social network owners see this as a value-added opportunity. Emerging companies such as Flowtown 10 and Rapleaf 11 aggregate and rent consumer data from many social media networks against a consumer record based on matching with data as simple as email ID. easier for brands to link sales to consumers. Some examples of these are photo-enabled product matching (eg Amazon, AutoTrader), smart phone cameras, intelligent barcodes and 1-click ordering. Mobile devices will enable consumers to download e-currency (eg e-coupons, loyalty points) and purchase items without a credit card. However, from a data viewpoint, this will be the point when a virtual ‘persona’ can be joined to their physical persona's record. This is because the world of real transactions is still based almost entirely in the physical world, and thus the data required to do business will include data such as credit card details (or online payments systems such as PayPal), verified by address that can only relate to a physical persona. Outbound CRM communications were sometimes made based on selecting lists of customers with a high propensity to respond, whereas SCRM communications can be real-time based on a ‘signal’ or ‘event’ from a social media transaction. This may be a known customer's comment on a community site, a product review by them, a blog or a ‘check-in’ update. Most of the time, to most of the market, the communication can stay in the social cloud and never touch the database. Some research claims that communicating to an individual as a member of a formal or virtual group is more powerful than communicating to them as a single person. This is especially true at the time when the individual is actively engaged in being a member of the group in either a physical environment or a digital environment. Imagine if a battery manufacturer could be present at every meeting of every model builders club in the country. In that environment, they can allow themselves to be in a mode of ‘available for buying’ rather than actively selling. Communicating within the social environment on a ‘one to many’ or better, ‘one to few’, basis therefore has its advantages. However, many brands will not want to simply interact with their HVCs and influencers randomly alongside all others in the social cloud. HVCs and influencers will underpin the revenue and margin of the brand, and therefore the data about them have to be treated as a strategic asset for the brand and a key source of competitive differentiation. Is it sensible to leave this in the social cloud where there is limited control? All but the most data-averse brands will want to ‘own’ data on at least these customers so they can interact with them on a more personal level. An important factor in terms of communication within SCRM is the power of peer-to-peer interaction, reference and recommendation. The concept of ‘Influencer Marketing’ is not new but has always been limited to member-get-member (MGM) recruitment, a crude form of marketing that was often distasteful to the influencer and therefore detrimental to brand advocacy. Social media is changing this. Influential commentators, bloggers and tweeters can have a greater impact on an organization and the perception of its offering than any amount of advertising. 12 Understanding influencers requires measuring their ‘influence’ and keeping a record on the database (if you want to recognize and engage them over time). This ‘influence ranking’ has to be derived from other information that can be sourced on the social cloud (eg multiple network membership; number of friends or followers, number of comments on their posts, their re-tweet ratio). 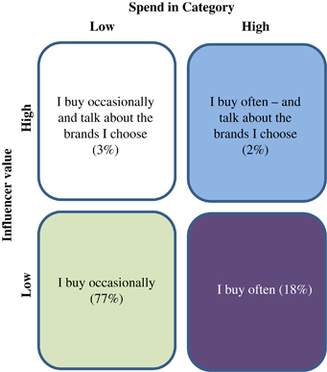 Influencers, when identified, need to be managed as HVCs even though they personally may have a low transaction value (see Figure 5, for researched figures for a global fast moving consumer goods (FMCG) company). Socially enhanced CRM data enable the targeting of the right people (brand advocates, influencers and HVCs — the people responsible for maybe 80 per cent of brand sales) with the right message, at the right time, through the right media to obtain the right outcome. In this way, SCRM can be more powerful than either S or CRM on their own. Personalization is less important in the world of Social than it is in the world of CRM. ‘Outbound’ communication via social media is largely about targeting relevant content to the social ‘containers’ that are identified as influential to brand users. One-to-few targeting will be used to respond to comments on fan pages. It is difficult to personalize in the social cloud. Personalized, one-to-one messaging is important over both digital and physical media — on the brand web/mobile site (eg welcoming and messaging individuals with their personalized content), as well as through direct outbound communications to consumers stored on the database (probably high value, brand advocates and influencers). Some website personalization can be achieved without a database. For instance, if a consumer accesses a website, the use of ‘cookies’ can help personalize the experience for the consumer the next time they come onto the site. Some social media containers (eg Facebook) provide profile information if a fan clicks from Facebook, which allows the brand owner of the website to personalize to a limited degree. However, the big opportunity for increased personalization comes from joining together information known about individuals and their social media personas. This would enable relevant content to be pushed to their mobile device, perhaps based on their value and profile, when they check-in at a location, or when they downloaded an application, or played an interactive game or made a comment on a blog. This is emerging marketing territory, but intuitively will enable extraordinarily relevant relationships between brands and consumers. Propensity modelling has become very sophisticated over the last decade, and many organizations can predict key behaviours (eg next flight, next car service, or policy cancellation) with high probability. The impact of social networks in the area of prediction will be to enhance these predictive models. The information available on the social media containers will enable a better understanding of the behaviours and attitudes of the individual, and therefore a richer ‘propensity to respond or purchase’ modelling is possible. It is possible that detailed data available from an individual's social networking activity can make a prediction of key behaviours even more accurate. A stream of negative comments on Facebook or Twitter about a service experience in a retailer or car dealer, for instance, can help predict a future ‘defector’. Do consumers and businesses want to be engaged with brands? Some do and some do not. In CRM days in data-poor sectors, unless the customer had joined a membership or loyalty club, it was difficult to know which of them at an individual level was engaged at all. The membership data stored and used to support ‘engagement’ resulted in typically ‘pushing’ communications to individuals at times it was felt were appropriate. In the social world, firms can ‘fish for’ and connect with interested customers by placing content in the places and contexts they find relevant and letting them self-identify. Email is still highly relevant, but social offers lots more chances to engage and interact. 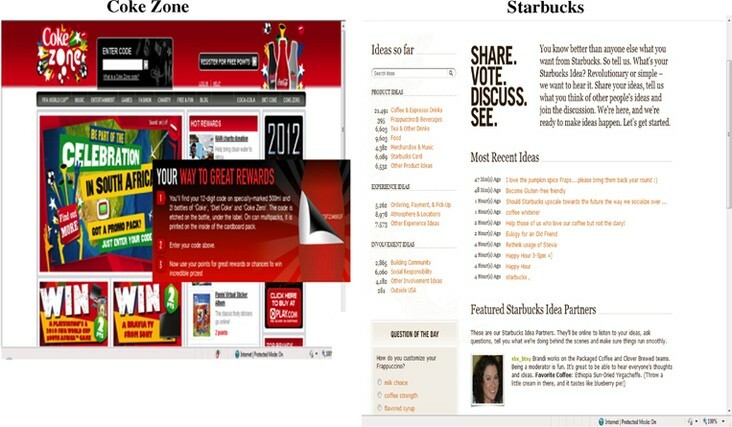 The engagement of these customers can be understood better by ‘ranking’ their engagement (or brand advocacy) and possible consumption based on building points on their customer record for each response, web hit, comment or participation in brand programmes (eg Coke Zone; Starbucks’ ‘Share, Vote, Discuss, See’) (Figure 6). In addition, getting to know what they tend to like and dislike will enable an understanding of the types of stimuli that will encourage or deepen their engagement. Do they respond to news, sports, celebrity, fun or environmental content, for instance? Which of these data need to be stored on the database? The data that need to be stored and maintained in a company's database to understand, track and interact may actually reduce with the advent of social media. First, data may be stored on brand advocates, HVCs, influencers and HVPs. Rather than hold personal records for anyone who comes into contact, brands will pan (scrape, rent or buy) the data they want from the social cloud. The databases of the future may have fewer, better qualified consumers who are strategically important, socially active and ready to interact. any actual transaction history (eg sales, responses, complaints). What might the data structure of the future look like? Table 1 shows where data could be held for a business-to-consumer organization with some degree of access to information on consumers, even if sales are through third-party channels. Where should data be held? Source: The Customer Framework © 2010. SCRM strategy will be driven by marketing but will need to be developed and executed enterprise-wide. A wide range of opportunities and challenges have been outlined by the impact of social marketing on CRM. However, this must be seen in the context of the wider business operation and aligned to the overall business strategy. Responsibility for social media and CRM has sat within the marketing team. A true SCRM strategy will still be driven by marketing but will need to be developed and executed enterprise-wide. This move towards the ‘social business’ — one that truly places consumer centricity as the heart of everything it does — means that SCRM will equally impact and be driven throughout customer service, support, sales, product development and of course brand marketing functions. Listen and learn: Where are the customers playing in the social cloud and what conversations are they having? The first and easiest thing to do is to listen to the buzz about the brand, product category and customer segment. Understand consumers’ socialgraphics 13 : A clear understanding of how consumers use social media is key to this and will ensure the strategy is based on real data and not just gut feel or latest marketing trends. Define SCRM role in customer engagement Strategy: At the enterprise level, brands will need to prioritize the development of a social business strategy that contains within it social marketing, but will fail unless based on strategic business and marketing objectives. These objectives must be to do with identifying, engaging with and selling to customers. Two key policies to support this will be defining whether to and how to recruit customers from the social cloud, and how to identify HVCs and influencers. Develop data model: Once clear on objectives, the next priority is the development of the data model itself. This should be based on identifying and then acquiring the most relevant structured and unstructured data to allow the delivery of real-time customized website experiences, as well as personalized outbound communications via email, mobile and social channels. It will include rules for codifying detailed data. Optimize website: Brands should prioritize the social optimization of the brand website, integrating social functionality to turn the site into a dialogue-driven, interactive and engaging experience. At the simplest level, brands should encourage ‘sharing’ and ‘liking’ capabilities within their sites, letting consumers take the brand messages out into their networks of consumers. The Edelman Trust Barometer 14 shows that advocacy, conversations with friends and peers are twice as credible a source of information as advertising. Brands should also offer consumers the chance to log-in and register using tools such as Facebook Connect or Open ID. Brands should also consider the creation of ‘owned’ communities within their own sites (of the type offered by vendors such as Jive and Lithium) to encourage consumer-to-consumer dialogue, customer service management and of course recruitment opportunities. Recruit fans: The next brand priority should be the recruitment of brand fans and followers within branded social pages. Social networks ultimately represent a gathering of interested and sometimes passionate brand fans, and brands should take the chance to offer a compelling proposition to recruit consumers into managed RM programmes. This can now be simply delivered within a Facebook page tab using a simple API mechanic. Welcome and activate: All fans, and consumers who have registered, should be welcomed to the brand in a way that is appropriate to the mechanism through which they have become a fan. Activation will apply to those who have downloaded an application and not used it, or have joined a loyalty scheme and become dormant. Many fans and registered customers lie dormant after the first transaction. Mechanisms should be designed to encourage interaction. Measure and evaluate: The final priority should be measurement and evaluation. Brands should establish metrics and a managed approach to report on the effectiveness and efficiency of their activities based on the objectives set at the strategic level. Many commentators have said that assigning a value to a Facebook fan is difficult and often misleading as it is not the fan itself that has value but rather what the brand does with the fans to drive incremental value. Using standard social metrics, such as the volume of fans, likes, followers and comments, is not a good measure of awareness or brand engagement. Forrester suggests 15 that a balanced scorecard is needed to evaluate the wider picture of the impact of the SCRM efforts, a focus not just on financial measures such as Return on Investment (ROI), but more on Return on Objectives (ROO). These might focus on Financial returns (has revenue or profits increased as a result of SCRM) but also on Digital returns (has the brand enhanced its owned and earned assets), Brand Returns (have consumer attitudes improved) or Risk Management Returns (is the company better prepared to respond to PR or reputation challenges). Social and CRM in combination is likely to be more effective that either social or CRM individually. Social can be used to engage consumers interested in the brand with content placed where they play and work, through PCs, mobile devices, screens, kiosks, tables and a number of new ‘channels’. Brands can interact with their consumers directly through social media without ever having to know who they are. However, social media containers are risky for brands. They do not own the ‘fan’ data; their consumers can drift to another social container very quickly, and targeting different types of consumers is not easy. In addition, the disproportional importance of high-value consumers, prospects and influencers means that they are strategically important to a brand. Like any asset, this implies that these groups at least need to be managed carefully over time (the term ‘managed’ is used lightly in this social media context). This is done because it protects revenues and develops profit, in a sustainable way, through engaging HVCs. The HVC may be happy for a company to interact with them through one-to-one communications taking the relationship outside of the social container. Ways brands add value with HVCs? To identify, match, understand, predict, communicate, engage and sell to these people, requires adopting and refining CRM approaches and the databases that support them. Altimeter group www.engagementdb.com plus State of the Nation IV chapter on satisfaction/engagement/commitment www.qci.co.uk. ‘Gap scraps new logo after online outcry’ http://www.bbc.co.uk/news/business-11520930. For a definition of Social Cloud see, Pezzi, R. Information technology tools for a transition economy, (2009), http://www.socialcloud.net/papers/ITtools.pdf, p. 3. Steve Ruben, Edleman re potential data privacy 9/11 http://www.steverubel.com/a-privacy-9-11-could-derail-social?utm_source=feedburner&utm_medium=feed&utm_campaign=Feed%3A+steverubel+%28The+Steve+Rubel+Stream%29&utm_content=Google+Reader.